We have to defend our silverware. I went back to see what I said in this opening manifesto before last year's semi-final and was rather unpleasantly reminded that Arsenal were tumbling down the table at the time; the Gunners were winless in four en route to Wembley and they had just been shoved to fifth after a 3-0 loss at Everton. There's a decidedly different mood around Arsenal these days as Arsenal enter Wembley as winners of their last eight games, both overall and in the league in general. Extend that streak to nine and Arsenal will be in their second straight FA Cup Final. But, make no mistake, it's not going to be easy just because it's Reading. Arsenal did not exactly beat Burnley in convincing fashion last weekend, and the less said about that match at this point, the better. The Championship side are going to be difficult to break down, but Arsenal will have learned a number of lessons about taking them seriously from their adventure against Wigan in last year's semi-final. We're 180 minutes away from properly defending our silverware. Come on you Gunners! Well, this is weird. There are only two names up there. ...uhhhh, jokes. I usually have something funny here, right? Ughhhhh, yeah, I got nothin'. I guess I do have to say something. Apparently, Jack Wilshere is fit again after a second run-out for the Under-21s. There has been some suggestion that Mathieu Debuchy could return and start at right back as well. Personally, I wouldn't change a thing in an outfield that has been clicking so well lately. Predicted XI: Szczesny, Bellerin, Mertesacker, Koscielny, Gibbs, Coquelin, Cazorla, Ozil, Alexis, Ramsey, Giroud. Reading's league matches have not carried the same weight as the cup as of late; the Royals have not won since they clinched a spot at Wembley. You would think that manager Steve Clarke might have been prioritizing the cup, then, but in a midweek fixture against Bournemouth on Tuesday, Clarke made only one change to the side that had started at the weekend. That one change was striker Pavel Pogrebnyak, who was rested after leaving Reading's 0-0 draw with Blackburn on Saturday on 84 minutes with an injury. I suspect he'll still be considered a doubt for tomorrow. The same goes for Nathaniel Chalobah, who faces a fitness test. ; he was removed from Tuesday's game on 67 minutes Chalobah is on loan from Chelsea because everyone is on loan from Chelsea. Predicted XI: Federici, Gunter, Hector, Pearce, Obita, McCleary, Norwood, Williams, Robson-Kanu, Cox, Pogrebnyak. could have and should have drawn. Keep that form train rollin'. Arsenal have won eight straight in the league for the first time since the Invincibles, but since this is not a league game, that's a little less relevant at the moment; they'll go for nine next weekend against Chelsea. Across all competitions, Arsenal have won eight straight since their loss to Monaco. They've also won 11 of their last 12 since the North London derby loss and 16 of their last 18 since the New Year's Day loss to Southampton. Arsenal's odds of winning the league have fallen to a paltry 2.2% (from 2.7%) after Chelsea won last weekend, further cementing that status as "pipe dream," but their odds of finishing in the Top Four (capitalized, since it's the name of a trophy, of course) is a healthy 98.9%. Nearly three out of every five simulations sees Arsenal finish second this year. As for Reading, they are now six without a win in the Championship after a Tuesday night loss at home to table-topping Bournemouth. They are eight points clear of relegation to League One with just four Championship matches remaining, so they are effectively safe from the drop as well. In further "non-ideal preparation," the Royals have not scored a goal in two and a half games, either. Unfortunately, from an Arsenal perspective, that means the FA Cup is all that Reading have left to play for, so you can bet they'll come out with guns blazing. Now, are you sure this happened? Arsenal have met Reading in 12 previous competitive fixtures; the Gunners have won all 12 of them. This includes three meetings during the 2012/13 season, when Reading was last in the top flight. You'll almost certainly recall the cup tie when they met in the fourth round of that year's League Cup because that game was bonkers. Reading, of course, went ahead 4-0 in half an hour. Arsenal pinged one back just before halftime. Then, they scored three more, including the equalizer with the final kick of regular time. Then, Marouane Chamakh scored to put Arsenal ahead, but Reading drew level again. In the 120th minute, Theo Walcott scored a winner. Then, Chamakh scored again, just to further confuse everyone. 7-5, after extra time. Lunacy. Arsenal won the league meeting at the Madjeski Stadium a month and a half later by a 5-2 scoreline, as Santi Cazorla had a hat trick. They won at the Emirates in March of 2013, 4-1. Well, Arsenal have lost four of their last five matches with the referee they'll have tomorrow, West Yorkshire-based Martin Atkinson. They have lost two of their three matches with Atkinson this season, and received a red card in the one match they did win. So, let's recap those, shall we? Atkinson was in the middle for Arsenal's 2-0 loss at Stamford Bridge in October, in which he gave Chelsea a penalty for their opening goal. Of course, it was a penalty, so there't that to consider... He was in the middle for Arsenal's 2-1 win over QPR on Boxing Day, in which he gave Olivier Giroud a red card. Of course, it was a red card foul, so there's that to consider... Atkinson was also the referee for the 2-1 loss to Tottenham in February, which is harder to forgive him for; Arsenal picked up five bookings on the day and I (subjectively, of course) feel that his harsh yellow to Laurent Koscielny is a big reason why Harry Kane was so open to head in the winner. Of course, that's just my opinion; any related debate with a Spurs fan on the topic would stop, objectively, if I point to the current table. With Reading in the Championship, they have not yet seen Atkinson this season. They didn't see him last year either. Their last Atkinson match was a 2-0 loss to Manchester City at the Madejski on May 14, 2013, which came days after City lost the FA Cup Final to Wigan. He also worked a 2-1 Reading win over Everton earlier in that season. Atkinson's eight red cards this season ties him for third in the category of most red cards; Craig Pawson and Anthony Taylor are tied for first, with nine apiece. 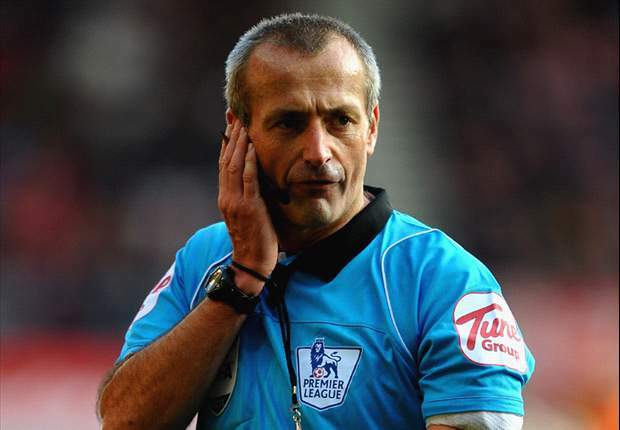 Last year, Atkinson showed only three red cards and they all came in a five day span around Christmas, two of them going to Stoke on Boxing Day in a 5-1 loss at Newcastle. John Painting is a contributing writer to the Modern Gooner and a goonering contributor to the Writer Modern. You can follow him on Twitter @zorrocat or Twitter him on zorrocat @follow. ... What? ?